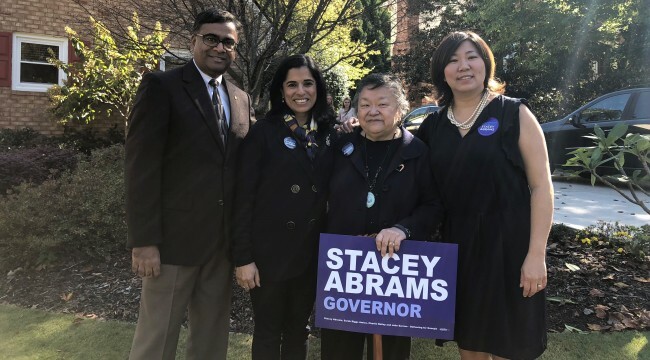 Nanda was in Atlanta to campaign for Gubernatorial candidate Stacey Abrams and other Democratic candidates ahead of this week’s election. Nanda made history as the first Indian-American woman to reach the helm of either of America’s federal parties. A lawyer and member of the Massachusetts Bar Association, Nanda’s experience includes practicing labor and employment law and serving on the boards of several nonprofit organizations. In her exclusive interview with NRI Pulse, Nanda shared her vision for the DNC, concerns for the nation, and the perspectives she brings to the table as a woman of color. “Stacey Abrams is a historic candidate, a hard worker and a person with deep integrity. It is an honor to spend even a couple of days being in the same space as her,” she said. 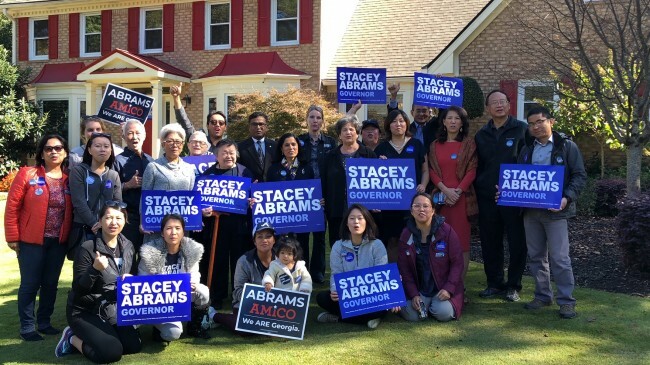 Highlighting Abrams’ humble beginnings, her struggles and eventual foray into politics, Nanda said one of Abrams’ biggest achievement is that she has worked across the aisle with a Republican governor to get things done for Georgia. 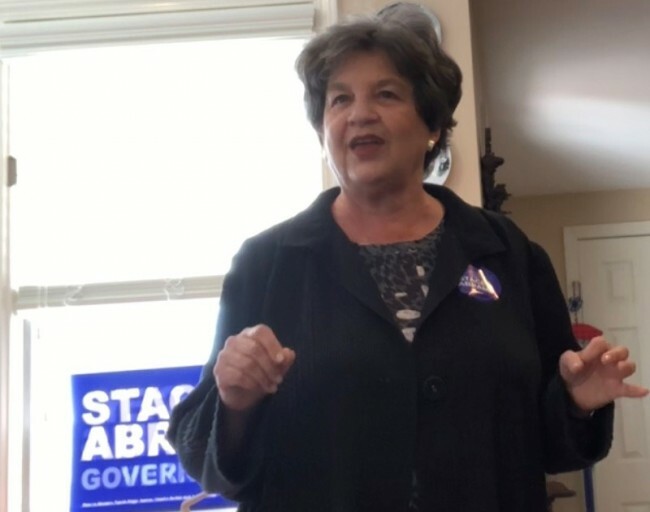 Noting that her principles come from a childhood that valued education, Nanda said Abrams supports early education and funding schools fully. A President who is running on a message that we are divided as a country and that someone else gets ahead only when someone else gets behind is one of the biggest challenges facing the country, Nanda opined. 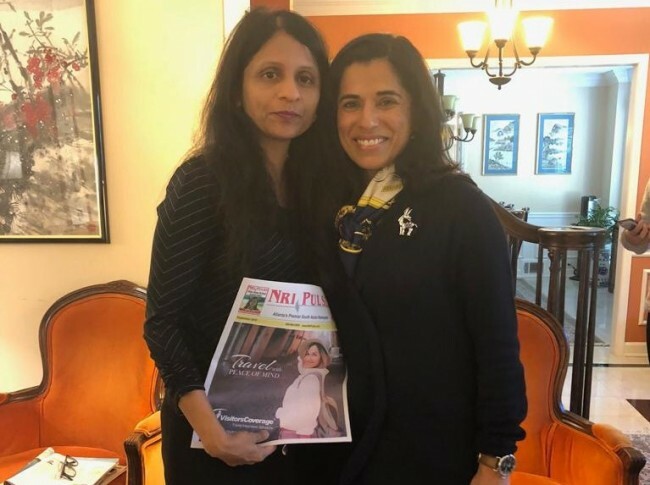 Seema Nanda (R) with NRI Pulse City News Editor, Jyothsna Hegde. Appealing to family values, Nanda said Indian-Americans who strive to bring families to settle in the USA along with them, must bring in the blue wave. “Republicans want to stop family based immigration. This is how we bring our parents and siblings into the country. “Immigration reform that the community needs to address, issues with healthcare and the fear that healthcare will be taken away for those with pre-existing conditions are some of the reasons Indian-Americans must vote for Democrats,” said Nanda. “Republicans control both branches of government. Democrats are way behind in the number of governorships we have, so we really need to elect Democrats,” she added. Addressing issues with the current immigration system, Nanda said the Democratic policy has and always will be holistic, including everything from border safety to long lines for visas. Pointing to an unprecedented, unchecked focus, as she put it, Nanda said the President was enforcing a taskforce that is looking into naturalized citizens since 1990, expanding office to look into any errors made while issuing naturalization. “You can do anything. Don’t not see yourself in a position just because you have not seen a person who looks like you in that position. We are seeing south Asian women in particular participating in all walks of civic life. You can do anything you put your mind to,” was Nanda’s advice to women of color who are aspiring to get into civic life. L to R: Tony Patel, Chair of AAPI Caucus, Democratic Party of Georgia, Seema Nanda, CEO, DNC, Bel Leong-Hong, Chair, DNC AAPI Caucus, and Grace Ming, Vice Chair, DNC. The Meet and Greet event featured Tony Patel, Chair of AAPI Caucus, Democratic Party of Georgia; Congresswoman Grace Ming, Vice Chair, DNC; Bel Leong-Hong, Chair, DNC AAPI Caucus, and Congresswoman Lois Frankel (Florida) hosted at the home of Lani Wong, Chair of the National Association of Chinese Americans on October 28, 2018. The cozy setting bustled with the energy of volunteers and activists who were fired up by the presence of the leadership in the house. Talking to NRI Pulse, Tony Patel, the Indian-American AAPI caucus chair said Stacey Abrams and Sarah Riggs Amico have broken through the glass ceiling in Georgia politics in a meaningful way and created opportunities for others to follow. “The 2016 elections and the rhetoric that followed has awakened our AAPI community like never before. Stronger engagement, exercising our right to vote, and supporting candidates who share a vision of America that is more welcoming has allowed us to deliver the margin of victory in close elections,” he said. “With the election of State Senator Sheikh Rahman and our continued friendship with Senate Minority Leader Steve Henson, our AAPI communities have gained a voice in policy making on issues important to us including language access, fair housing, and affordable education. Nationally, we have gained a voice in Congress by helping elect candidates in Hawaii, Illinois, California, New York, and Texas and will continue to expand our reach into other states during the 2020 Presidential elections,” he added. “I’m looking forward to working with Seema and DNC which wants to cater to every zip code and not just during elections,” said Grace Ming, in her brief address at the meet and greet. Leong-Hong urged everyone to vote and make a difference. “This is an exciting time for all of us,” she said. Rep. Frankel cheered on the volunteers. “Raising money is different. But what you guys do, knocking on doors, connecting to people, makes a big difference,” she said.